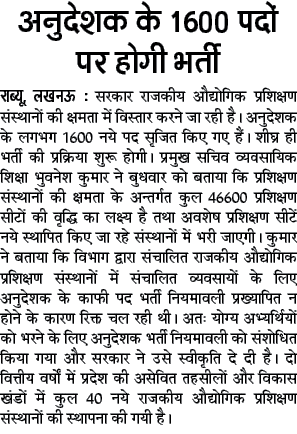 application form are invited for 48 subject for 1600 posts of ITI Instructor. Eligibility criteria : all high school pass candidates can fill application form for ITI Anudeshak posts. candidates are also required to complete Engineer / Diploma in engineering program . Application form submission and online registration last date is : December 2015 .